Lots of rest, lots of gatorade and lots of snuggles (and antibiotics) were just what this little man needed. By the afternoon his fever broke and he was back to his chipper self. As crazy as it was for me to miss such a busy day at school, a lay-low rainy day was just what the doctor ordered for both of us. 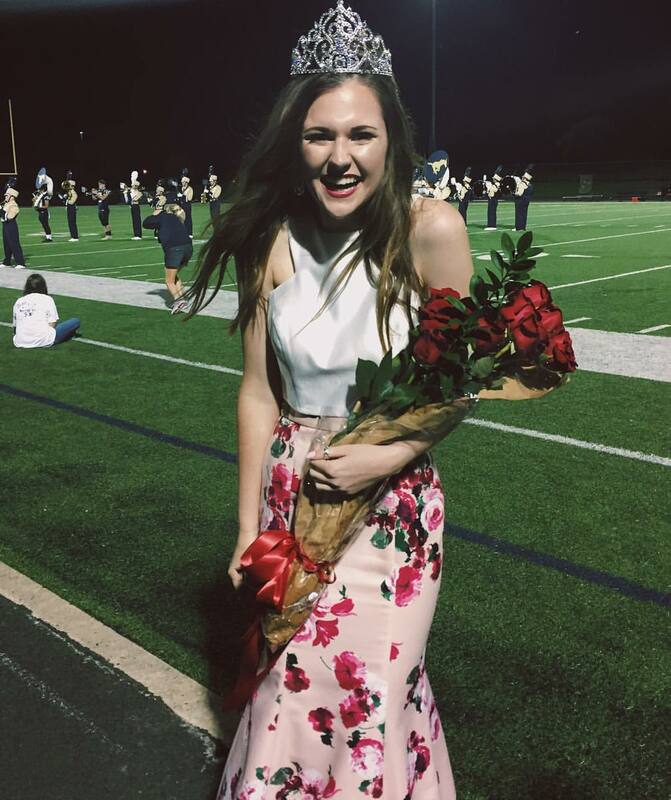 The middle school dance didn't start until 10 pm Friday night (so the kids can have a chance to attend the varsity football game first) and while I was running around setting up, meeting vendors and picking up food look who was crowned Homecoming Queen!!! I brag on "Our Anna Grace" a lot - but y'all... it is so well deserved. She is smart, kind, genuine and PRECIOUS and I was so excited to see her get recognized by her peers. And look at how gorgeous she was! Does the dress look familiar??? This year I decided to keep the decor to a minimum and instead hired an incredible lighting company. So worth it and so much fun! We spent pretty much all afternoon playing outside, flexing our muscles and eating cake from our neighbors birthday party. It was warm, but breezy and we had a great time. I was in bed and asleep before 10 p.m on Saturday night (without a stack of grading next to me!) and it was GLORIOUS!!! After church Sunday morning we got out our Halloween decorations, cleaned up the yard a bit, took naps (#hallelujah), played outside and I went up to school to get a few things done. A wonderfully restful day. Thank y'all so much for all your encouragement last week via the blog and social media - I so appreciated all of it!!! I'm adding you Sheaffer's comment. You looked so cute at church yesterday! Loved your hair and all those layers! Your weekend sounds like a great mix of busy and relaxing. Such fun, precious pics! We've had strep at our house, too! Glad everyone is feeling better. Where did you get the stack of pumpkins near the front door? Love those and I'm looking for something like it :) Thank you! I just love your blog! You inspire me every week! I am so going to make the pasta for dinner tonight! Glad to hear you and Mason are feeling better. I love your earrings!!! Have a great Monday! So much to say: you looked adorable at church! And, why do kids love boxes so much?! Also, the dance looked like so much fun! Good job, friend!! I'm glad Mason is better! Great idea to invest in awesome lighting for the dance! So glad that you are all feeling better to start off the new week! Happy Monday, Andrea! Oh Griffin jumping in the last picture sends me over the edge - what a cutie!!! Where did you get your brown purse? Love it! Hope he is doing better and nobody else gets it. I love that brown purse and I'm dying to know where it's from?? Glad y'all are feeling better! I remember the horror of middle school dances. So embarrassingly awkward! So glad you guys are feeling better! Yay for Anna Grace! I loved her dress from prom and it was the perfect choice for Homecoming Queen! Here's to a calm, boring week-lol! Sometimes kids get sick and it ends up being the day of rest you both needed. That final picture...you look gorgeous! Love this post! Need brown leather bag details! !